Introduction: In what has now become an yearly tradition Pro Angler and Host of �Ultimate Bass Radio,� Kent Brown, put together another Media Day on Lake Pardee to bring together some of the top Pro Anglers with members of the fishing media to talk shop, check out some of the newest tackle and techniques, and even do a little fishing. 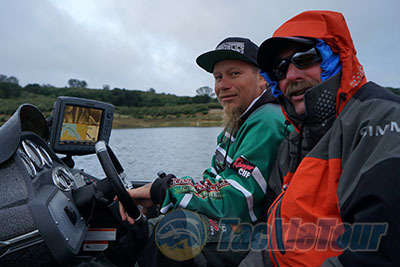 The event started out the night before at Jackson Rancheria Casino and Resort where the anglers get to spend time talking to the pros about the current season. This year attendees included some top pros including B.A.S.S. Elite Anglers Shaw Grigsby, Fletcher Shryock, Aaron Martens, Keith Combs, Fred Roumbanis, and Paul Mueller. There were many other FLW Pros there and well known big bait anglers as well, all sharing their favorite techniques to catch bass on tour and when trophy hunting. This event I was paired with B.A.S.S. Angler Shaw Grigsby and FLW Angler Earl Dalton in the morning session, and pro angling swimbait specialist Russ Graves in the afternoon. Earl Dalton fishes for Jackson Rancheria and Lake Pardee is a one of his home lakes. Pardee is a very picturesque lake that is known for trophy largemouth and smallmouth fishing, and this fishery is fueled by large trophy trout and Kokanee salmon plants. As you might have guessed these plants not only give the bass plenty to munch on but also help make this an excellent venue for those that enjoy targeting lunkers with swimbaits. 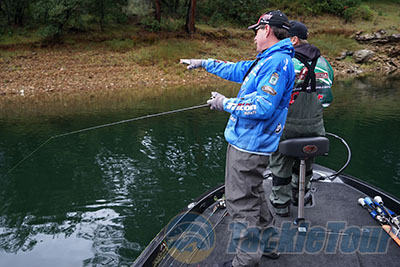 With the ultra-clear water that Pardee is famous for it isn�t uncommon to see a pack of four and five pound fish chasing a swimbait back to the boat, but getting them to commit and strike can be a challenge in this clarity as well. This was the first time that Shaw had ever come to Pardee so we leaned on Earl to show us the spots and put us on the bite. Earl is also known for fishing swimbaits and on the deck of his boat he had a number of popular baits tied on including a 68 Huddleston as well as a Trash Fish. As we powered away from the launch ramp I compared notes with Earl and showed him some of the Deps Slide Swimmers that I had tied on. 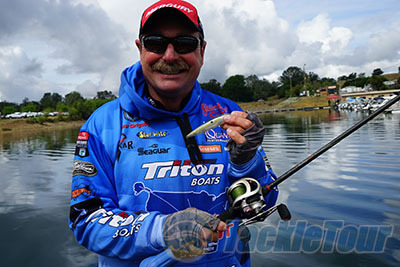 Shaw�s face absolutely lit like a kid in a candy store up as he examined the baits. 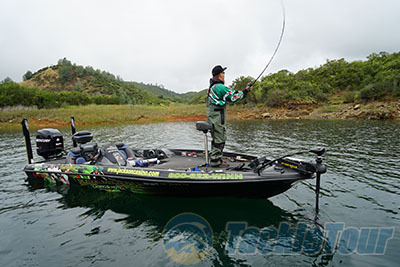 While there is certainly overlap, fishing tournaments requires a very different approach than that of trophy bass hunting, and Shaw was not as familiar with some of the exotic swimbaits that we had prepped for the day. 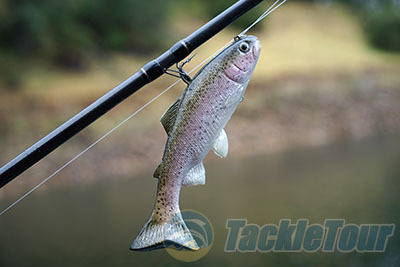 �I love fishing, but I also love to learn about new fishing techniques and lures every opportunity I get,� Shaw said as he checked out the big baits. His mouth was agape when we told him how much a single Deps Slide Swimmer 250 retails for ($179.99), if you were lucky enough to even find one. Earl powered up the river and we started fishing a variety of coves along the shoreline. As expected the visibility was outstanding and we could see more than 25 feet down. There were beds everywhere but nobody was home. The cooler weather likely pushed the fish back so we had to either get fish to come up or target them deeper.